School of Business Studies and T&P Department of Sharda University is organizing a half-day HR Seminar on November 24, 2018 in association with Human Resource Federation of India (HRFI). The purpose of this HR Seminar is to provide a platform for interaction among HR leaders from industry, faculty and students, and also, to explore & enhance the placement opportunity for our students. Department of Electronics and Communication Engineering, School of Engineering and Technology is organizing the Industrial visit for 4th-year students of ECE at Deki Electronics Plant, B-20, Sector 58, Noida on 26th November 2018 (Monday). 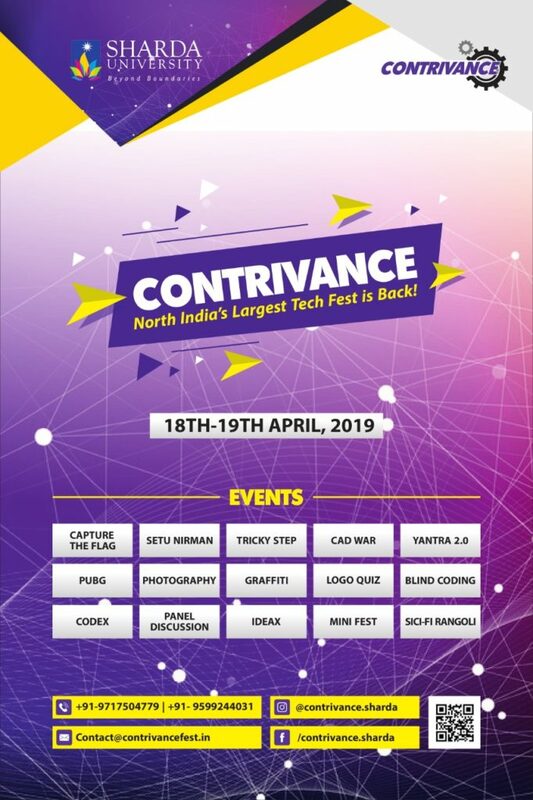 Venue: Deki Electronics Plant, B-20, Sector 58, Noida. The company is responsible for manufacturing electronics components like capacitors, diode, BJT…ets. Apart from these, they also produce, CFLs, Regulators, switch gears….etc. Department of Community Medicine and General Medicine, School of Medical Sciences & Research and Sharda Hospital, Sharda University are jointly observing ‘World Obesity Day’ on 26th November 2018 by organizing the following activities. 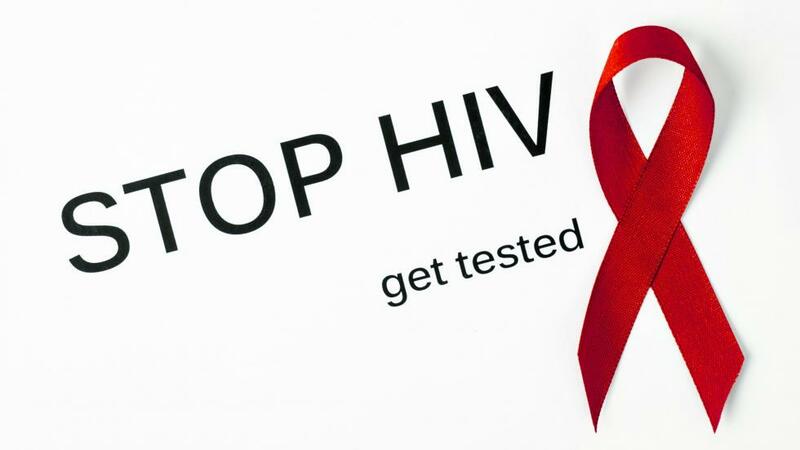 Health camp for Screening of Non-communicable disease at RHTC and UHTC. Health awareness session on ‘Obesity, Risk factors and its Prevention’ by Interns posted at the centers. Department of Computer Science and Engineering, School of Engineering & Technology is organising a Community Connect: A Visit to Govt. Prathmik Vidyalaya, Village Makoda, Gautam Budha Nagar, for the students of B.Tech (3rd year) Computer Science & Engineering on 26th November 2018.
h) ratio of Female students and others. Organising free blood sugar testing camp for staffs at SNSR,SU. 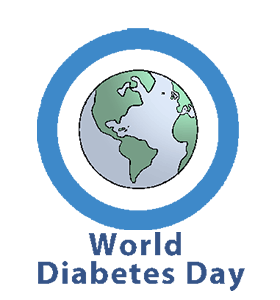 World Diabetes Day was launched in 1991 by the IDF and the World Health Organization (WHO) in response to the rapid rise of diabetes around the world. World Diabetes Day is the primary global awareness campaign focusing on diabetes mellitus and is held on 14 November each year. Diabetes can affect the entire family in several ways. In particular, blood relatives should be aware that a family history of Type 2 diabetes puts them at higher risk for developing both Type 2 and pre-diabetes. Early diagnosis and treatment is key for a healthy life with diabetes. Students will be able to know how to diagnosed blood sugar. Department Of Mechanical Engineering, SET is Organizing an Introduction and Demonstration of BMW Car Engine on 26th November 2018 at 11:15 AM. BMW India Pvt. Ltd., No. 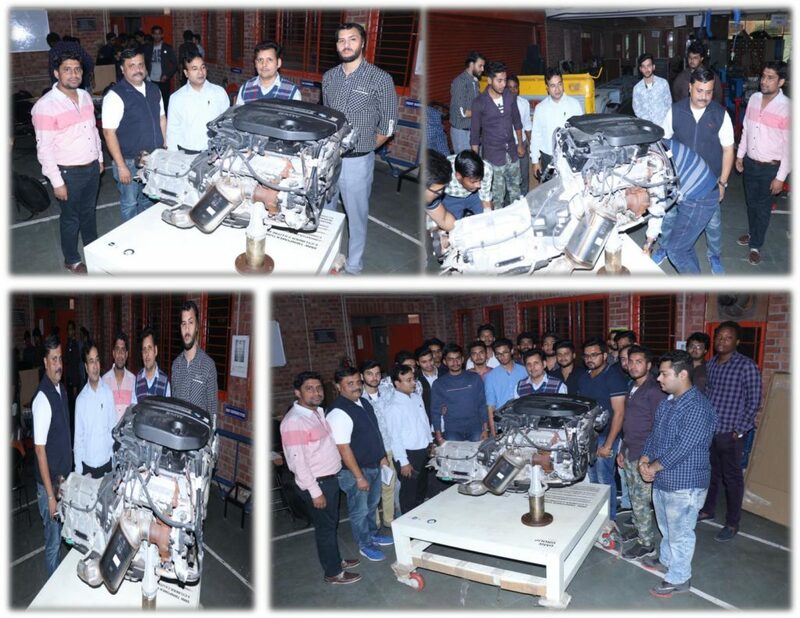 36, 1st Cross Road, 1st Main Road, Off 2nd Avenue, Mahindra World City, Natham Sub Post, Chengalpet 603004, Kancheepuram District, Tamil Nadu has gifted BMW engine to Sharda University. The student of Mechanical and Automobile Engineering have an opportunity to learn about the latest technologies used in BMW’s engine and know how of the engine. The student of Mechanical and Automobile Engineering have an opportunity to learn about the latest technologies used in BMW’s engine and know how of the engine. Department Of Nursing Education, SNSR is organizing Visit To Central Health Education Bureau on 27th November 2018. In consonance with the recommendations of the Bhore committee and the planning commission, central health education bureau (Cheb) is an apex institute created in 1956 under the directorate general of health services (DGHS) ministry of health & family welfare, Govt. of India to promote health education in the country. 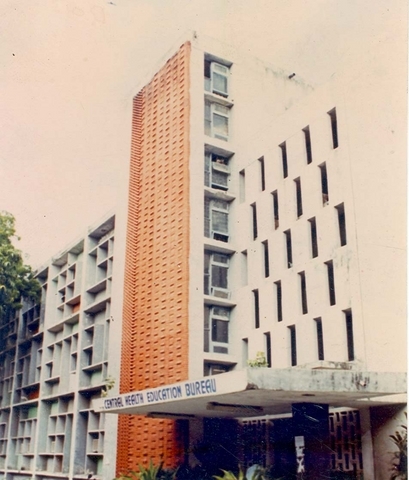 The publicity unit of the directorate general of health services which has existed for several years before was merged with this newly created institute. The bureau which started with one unit and a few staff members in 1956 grew in size and activities gradually and had seven divisions with trained technical personnel and one administrative division. Describe the philosophy and objectives of the organization. Know the administrative setup & staffing pattern of the organization. Discuss the process of production and distribution of health education material in relation to various health problems and programs by the organization. Discuss the research activities rendered by the organization. Appreciate the collaboration of CHEB with international agencies in promoting health education activities. Understand the guidelines provided by CHEB for the organizational set-up and functioning of health education units at the state, district, and other levels. School of Nursing Science &Research (SNS&R) Child Health Nursing Department is Celebrating Premature Baby month by performing Kangaroo Mother Care Role Play on 28th November 2018. Caring low birth weight babies is a great challenge for the neonatal care unit and the family. Number of low birth weight babies is still far beyond the expected target in our country. The cost of quality management of these babies is increasing day by day. Kangaroo Mother Care is a low-cost approach for the care of low birth weight babies. Kangaroo Mother Care (KMC) is a special way of caring low birth weight (LBW) babies by skin-to-skin contact. This method of care was introduced and popularized by Dr. Edger Ray, Dr. Martinez and Dr. Charpak in late 1970s. Early continuous and prolonged skin-to-skin contact between the mother and her baby is the basic component of KMC. The infant is placed on his mother’s chest between the breasts. The baby on KMC is breastfed exclusively. Skin-to-skin contact promotes lactation and thus facilitates exclusive breastfeeding. To introduce, expand and strengthen KMC practices to improve survival of low birth weight and preterm babies. To understand the benefits, components, and prerequisites of KMC. To improve and monitor KMC related processes and outcomes. To determine mothers’ prior knowledge of KMC and awareness about benefits of KMC for preterm babies. Ms. Vigy Elizebth, Asst. Prof. SNS&R. Department of Mass Communication, School of Creative Art, Design & Media Studies (SCADMS) is organizing village visit to Gram Luharli, Gautam Buddha Nagar as part of Community-Connect programme for the students of BA(JMC) final year on November 29, 2018. Luharli 139 Basantpur Bangar is a Village in Dadri Block in Gautam Buddha Nagar District of Uttar Pradesh State, India. Total population is 4389 and number of houses are 739. Female Population is 46.4%. Village literacy rate is 65.4% and the Female Literacy rate is 24.3%. a. Nukkad Natak: A group of students shall be performing a Nukkad Natak (Street Play on common problems in the society and their simple solutions. After the play the students shall be asking the bystanders about the moral / learning of the play and how can they bring the learning to use it in their daily lives. Later on, a report will be presented by students to their mentors that shall be evaluated. b. Photography Workshop for Students: Students shall be conducting a practical photography workshop with school students of a public and a private school. The aim of this workshop is to help the school students learn and explore their visual creativity. Later on, a report will be presented by students to their mentors that shall be evaluated. c. Field Reporting: Students shall be interviewing and researching about the common problems of the village from the residents. They shall be writing a feature/article with photographs that shall be published in the house journal of the department and evaluated by their mentor. d. Audio/Visual Interview: Students shall be identifying some achievers from the village and bring out unique audio and video stories of the village. Some best stories shall find space on the community radio station Suno Sharda 90.8FM while others may be put on YouTube channel. Later on, a report will be presented by students to their mentors that shall be evaluated. 1. Students will be able to connect with the community by exploring their problems, day-to-day life activities etc. 2. By taking the workshops of school students, our students will be able to boost up their confidence and in return will have a sense of belonging to the community. 3. Students will be able to understand the media habits and psychology of the villagers, as their prospect audiences.